I love finding weird alternative uses for standard kitchen supplies, like 56 unusual applications for rubbing alcohol, or 200 amazing uses for coconut oil. Hacks like these save me money and time, and they are just downright fun to try and share. So I got to thinking about sugar. Sugar is something I always have an overage of, largely because I use stevia to sweeten most food and drinks. I buy sugar because I need it for a couple of recipes I make now and again, but it comes in those huge sacks, and most of it generally goes bad before I can use it and needs to be thrown away. I hate to waste anything, so I wondered if maybe that sugar could be put to good use outside of my cooking. 1. Make cut flowers last longer before they wilt. 2. Give your garden a needed boost. 3. Stop your baked goods from going stale right away. 5. Scrub oil and grease out of your skin. 6. Deter wasps from your home and garden. I would never have thought of any of those in a million years on my own (how do folks on YouTube come up with this brilliant stuff?). I am pretty sure between all of these, I will finally be able to use up my sugar before it goes bad. 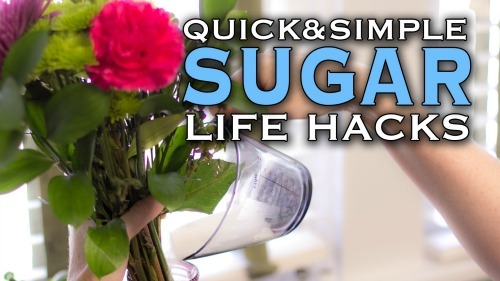 Hurray for life hacks!